Fox McCluskey | Anthony Dale George, Jr.
Tony George grew up in Stuart, Florida and returned home after law school to raise his family. After 24 years in private practice, Tony joined Fox McCluskey in 2014. Outside of practicing law, Tony successfully kicked two children out of the house (to date), leaving only the youngest three at home pursuing elementary school. He enjoys snowboarding and history. He is married to Debra Joy George. Tony practices elder law. In addition to traditional wills, trusts and probate, Tony has extensive experience in guardianships for minors and incapacitated adults and the related areas of guardian advocacy and custodianship. Tony assists business owners in tailoring trusts to properly plan for generational transfer of ownership while minimizing taxes. Tony also tailors trusts to the needs of disabled beneficiaries (or beneficiaries with a history of drug or alcohol abuse). Tony helps families qualify a member of the family for Medicaid when necessary. 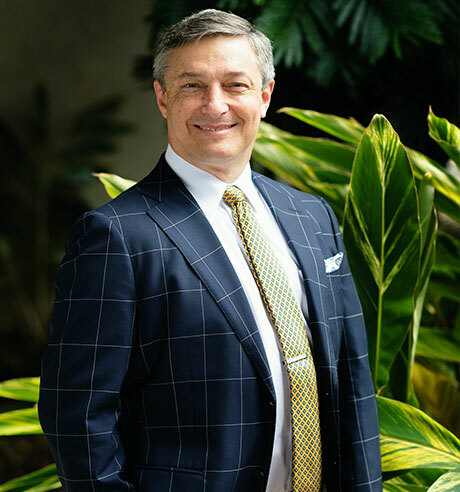 Tony assists personal injury attorneys in structuring and obtaining Court approval of incapacitated or disabled (SSDI or Medicaid) clients' settlements. Finally, Tony litigates in the areas of probate, trust and guardianship.